Back in the day, I would have called Tess Gerritsen’s Rizzoli and Isles series of books a guilty pleasure. That was back in my book snob days (which you can read all about here). Now I can happily tell you that I’m a fan of Rizzoli and Isles in both of its incarnations: as a slightly goofy TV series and as a darker book series. Each has its own set of rewards and they’re so different that they have very distinct personalities. What’s different and what’s the same? Read on to find out. There were some big changes in the transition from the page to the screen, most notably the drastically different characterization of M.E. Maura Isles. In Gerritsen’s version Isles is a serious loner, nicknamed The Queen of the Dead for her dedication to her profession (with a nod to her severe black bob haircut and pale skin). 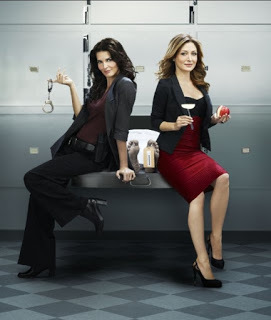 As played by Sasha Alexander, TV’s Maura Isles is a fashionista and an amusing know-it-all. She’s still fiercely dedicated to her job (driven by the belief that someone must be able to speak for the dead in order to find them justice), but she’s a fun-loving, social creature. Comparing the two versions could cause whiplash, so be careful. I guess I can see why they made the change in the transition to TV. Their Maura is much more readily lovable for a viewing audience, for one thing. For another, Jane Rizzoli is already a serious, driven, kind of aggressive woman, so pairing her off with a lighter character gives the stories more range of motion: more room for humor, more room for conflict between the two protagonists, and at the same time more room for camaraderie to develop between them. They also seem to intentionally amp up a sort of pseudo-lesbian dynamic between Rizzoli and Isles. They feel almost like a couple more often than coworkers, which is especially amusing given that in the books they aren’t exactly friendly. In Gerritsen’s world they respect each other, help each other, but often operate in different circles. The books even alternate between Jane-centric and Maura-centric plotlines, which wouldn’t allow them to share much screen time in the TV world. As for Rizzoli, in the books she finds herself settled down with a husband and child fairly quickly, which I suppose wouldn’t make sense in a TV series. She’s much more free to devote her time to fighting crime in Angie Harmon’s single-woman version. There isn’t much of a supporting cast in the books (Rizzoli’s partner, Nick Frost, being the only consistent recurring character), so the TV show took some liberties with people who pop up here and there to flesh things out. Vince Korsak, a sad-sack retired detective who gives Jane an assist in one novel (and pops up here and there to marry her mother later), is brought back to the force by the lovable Bruce McGill. Jane’s mother Angela had some small, incredibly annoying appearances in the first season before being promoted (and made less shrill) to full-time in the second season after getting a divorce and opening a cafe in the Police Department’s lobby. And Jane’s brother, Frankie, brings a playful sibling rivalry to the force as an officer trying to get onto the homicide department. As a TV show, Rizzoli and Isles doesn’t take itself too seriously (which is a complaint you could lob at the books). It’s light and goofy and full of heart, which makes it good for a bit of escapism during the summer months. Harmon makes a solid Rizzoli–a dedicated career woman who has a hard time letting anyone get close to her as she tries to make it in a male-dominated field, but lightens her up a bit to make her grumpiness funny. As someone who read the books before the TV show came out, I still have a hard time reconciling the drastically different version of Maura we get on screen, but it’s hard to deny that Sasha Alexander makes it work. Some episodes are a little heavy on schmaltz. Rizzoli occasionally squabbles a bit too hard. But it’s hard to dislike the show because they’ve sanded out a lot of the potentially unlikeable aspects. I’ll do a separate post breaking down the books one by one (check out Part I here), but for now I’ll just say that Gerritsen’s version of Rizzoli and Isles is a lot grittier. She isn’t afraid to let her characters make mistakes and she knows how to make those mistakes something the reader can relate to. It gives the characters more depth and, well, character. They go on a journey in the books that’s missing from the TV series. Jane goes from staunch loner to wife and mother trying to balance her dedication to her career with the family she loves. Isles struggles to find the strength to accept that her birth mother is a criminal and suffering from a serious psychosis; tortures herself by falling for a priest; and eventually forms a sort-of family with an orphan who understands her self-isolation all too well. Interestingly, the action in the books all seems to take place during either winter or summer. Gerritsen’s descriptive style doesn’t really allow for in-between months–it’s either freezing cold or deadly hot in her world. If I had to choose one, I’d probably say go with the books. The long-term rewards are better because you get to see the characters develop in ways the TV show can’t allow. Plus, Gerritsen’s grittier outlook just speaks to me more. Maybe that’s because I knew the books first, but hey. It just seemed to lose something when they traded grit for quirk. Lucky for you, though, there’s no need to choose only one. Really, there’s no harm indulging in either, so I say go for it. Each format has some points in its favor so feel free to pick the one that speaks to you. What about you? Do you prefer your stone-cold serious Maura or super-smart fashionista Maura? Or would you rather have your cake and eat it, too (like me)? Only just discovered that these books are a TV series. Quite enjoyed it so far but I’m really disappointed to hear that the grit and action – along with some of Maura’s characteristics and relationships- will not appear on the screen. The book where she meets her “adopted son” in the snowy wilderness would have been great on TV. I guess I was hoping for a more “C.S.I.” feel but it’s more “Bones” I think. We kept waiting and hoping for Father Brophy to show up as well. Alas.